Alaska Milk Power Camp Director and Philippine basketball legend Jojo Lastimosa joins the National Training Camp of the Jr. NBA Presented by Dutch Lady Vietnam to be held July 13 to 15 at Ho Chi Minh City, Vietnam. Dutch Lady and Alaska Milk Corporation are both under the FrieslandCampina family. Lastimosa will be the lead assistant coach of basketball operations specialist for NBA Asia Chris Sumner who will run the camp. “It’s a great opportunity for me to be able to share my knowledge of the game once again not only with my countrymen but now outside of Manila. I’m not only representing Alaska Milk, I’m also representing the Philippines. I’m aware that we have Filipino players playing for Vietnam but being able to teach there firsthand is awesome,” said Lastimosa. “My role in Vietnam will be the same as in the Jr. NBA in the Philippines. I will help organize the camp and teach the local coaches on the skill stations. The objective is the same in all Jr. NBA camps: to find the best 10-14 year old players. But the most important part really is making the Vietnamese aware of how beautiful this game of basketball is,” said Lastimosa. The NBA’s international youth development program aims to promote participation in the sport of basketball, improve child fitness and teach the public the importance of proper nutrition especially of drinking milk. Here in the Philippines, Alaska continues their partnership with Jr. NBA to help young boys, and girls, become better individuals and encourage them to embrace a healthy lifestyle by engaging regularly in sports activities and through proper nutrition. Under-nutrition also remains to be a public health concern affecting nearly three out 10 children. Alaska recognizes the need of Filipino children for proper nutrition. According to the 7th National Nutrition Survey done by the Food and Nutrition Research Institute and the Department of Health, obesity is increasing with nearly two out 10 children considered as overweight. Through the program, Alaska leads in promoting a healthy lifestyle, especially among children, through regular sports activities and proper nutrition through its leading brands, Alaska Powdered Milk Drink and Alaska Chocolate Powdered Milk Drink. 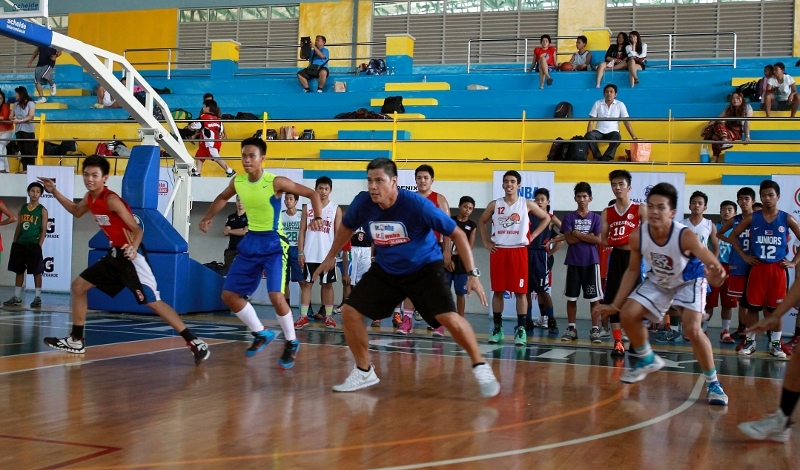 In the camp held in the Philippines Lastimosa drew from his personal experience as a former national basketball player and professional to teach the participants how to become not just the best basketball player but the best person that they could be. The basketball clinics in Vietnam have already selected the top 40 boys and 24 girls, aged 10 to 14, who will participate in the National Training Camp. The camp will be attended by Boston Celtics center Kelly Olynyk who will teach the game in the NBA Cares community outreach. The camp covers a three-day intensive training schedule and will culminate in the selection of 14 boys and girls who will be named as the inaugural 2014 Jr. NBA Presented by Dutch Lady Vietnam All-Stars. From Ironman World Championships in Kona, Hawaii to Alaska Ironkids in Manila, the triathlon hype is still on. Some 149 junior triathletes with ages 6 to 14 years old trooped to Palms Country Club, Filinvest on October 20 for the Alaska Ironkids Triathlon year-ender event. As early as 6am, the young triathletes, accompanied by their parents, were all geared up to race in their respective age group category. While others seemed relaxed, others just can’t contain their excitement. For some, the triathlon event may just have been a high end game, for some it was a high competition. It’s quite unusual not to know that some of these young triathletes were born to triathlete parents. Some are even members of prominent triathlon teams. As each minute ticked towards the swim start, participants were allowed to do a warm up swim. They were also grouped according to their age – 6 to 8 years old, 9 to 10 years old, 11 to 12 years and 13 to 14 years old. Aside from the individual categories, the event also included two relay categories – 6 to 10 years old and 11 to 14 years old. A quarter past 6, Race Director Ani de Leon-Brown, who is a seasoned triathlete herself, conducted the race briefing. The race commenced with a swim start for the 6 to 8 year old group. The participants, despite being very young, were on a race mode as they make their way out of the 100m swim down to the transition area where they mount onto their bike for a 3km bike ride, and a final transition to a 1km run. With 30 minute intervals, all participants in age group and relay categories have gone on to race their respective distances. Parents, relatives and friends have kept the energy on the highest level as they cheered for the participants. While it seemed more of a game for the younger ones, the older participants completed each leg of the race in a competition – trying their best to catch up with a racer ahead of them, or maintaining a lead. They have trained well enough for the race as evidenced by the way they make a left or right turn and accelerating or decelerating their bike speed. Maintaining a good lead, especially in the run leg of the race was crucial as it gives them an assurance of make a podium finish. Soon, the Top Three Finishers for each category have made it to the finish line. They received their finisher’s medal, their parents at bay taking photos and feeling much prouder seeing their children successfully complete the race. As everyone was waiting for the awarding ceremony, participants and the spectators alike were treated to a refreshing Alaska Chocolate Powdered Milk Drink at the Milk Station, as Alaska strongly believes that nutrition plays a very important role in the development of each child. And through its various sports program like Alaska Ironkids, children, at a very young age, learn the right moral values such as sportsmanship, teamwork and discipline. And for a job well done, trophies were awarded to the Top Three finishers in the individual and relay categories. View the complete race results HERE. Stay updated by logging on to www.ironkidsphil.com.